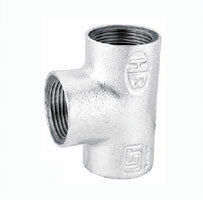 HB has carved a unique niche in the field of Pipe Fittings, with the widest size range of 1/4″ to 8″, it has been India’s largest ISI marked heavy pipe fittings for over 30 years now. HB Malleable Cast Iron Pipe Fittings follow the plus tolerance of BIS specifications. HB Pipe Fittings are subjected to rigid inspection at various stages of manufacturing to ensure their reliability. The brand HB today stands for BEST QUALITY, COST-EFFECTIVE, WIDEST RANGE & EXCELLENT SERVICE. This reputation has been achieved by producing consistently accurate and reliable quality fittings combined with very efficient sales and after-sales network throughout India. HB Pipe Fittings are approved & regularly used by all the major government, semi government, builders, contractors and domestic consumers across India. HB fittings are repeatedly used for industrial, agricultural, apartments, bungalows, villas, high rise buildings and other piping installations on ground, underground and concealed without the fear of faults and the rectifications there of. The brand image of HB is envied for its impeccable standing & trust with the customers.